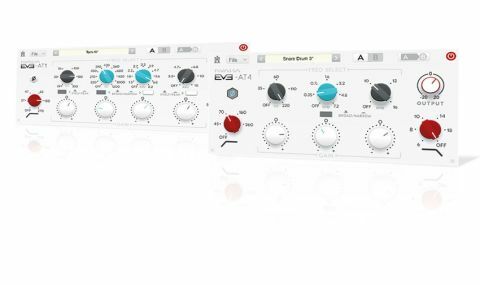 Classic analogue EQ emulations at a great price, the EVE-ATs aren't perfect but do a great job of capturing that Neve sound. Authentic emulations of originals. Each EQ has its own sound. Simple layout - easier than real Neves! Great price. Useful presets. No transformer modeling. Gain controls have no dB scaling. Kuassa's EVE-AT Bundle comprises two EQ plugins (VST/AU) - AT1 and AT4, also available individually for £32 each - inspired by the classic Neve 1081 and 1084 hardware units respectively. Neve EQs are renowned for their musicality and particular curve shapes, and the 1081 and 1084 differ enough in terms of design and sound to fully justify Kuassa's decision to emulate both. The 1081 is a powerful 6-band EQ with stepped high- and low-pass filters, and four main EQ bands with stepped centre frequency settings. Two central peaking bands (low mid and high mid) are flanked by low and high shelves. The former sport broad and narrow Q width options, while the latter offer a choice between shelf and peak behaviours. EVE-AT1 matches all the EQ settings and notched frequencies of the original 1081 but does away with the dual concentric knobs and esoteric layout in favour of the now-established spread of low to high bands from left to right. Neve's 1084 is an enhanced version of their earlier and much revered 1073, differing in the addition of a low-pass filter and a more flexible 3-band EQ. Again, the EVE-AT4 uses more contemporary controls and layout. Rounding things off in both are phase (well, polarity) invert and output trim (+/-20dB) controls. Finally, it's worth noting that these plugins only address the EQ sections of their hardware inspirations and not the mic preamps, which aren't emulated in any way. "The AT4 is the more characterful, its strengths being broad 'brushstroke' usage"
As expected, each of these two EQs has its own sound and behaviour. The AT4 is the more characterful, its strengths being broad 'brushstroke' usage - adding sheen to acoustic guitars and vocals, for example - and general bass boosting. In fact, it makes for a great mix buss EQ if you're just after a bit of sweetening. Factor in the filters and more precise jobs become viable, though total precision is hampered by the limited choice of frequencies. As noted, the AT1 offers much more flexibility, with wider crossover between frequency bands and many more frequency settings. This makes it a much more useful EQ in general, and we found that between the low shelf, low-mid peak and high-pass filter, we could easily shape the lows in kick drums, snares and basses, or scoop and cut undesirable frequencies from keyboards, guitars and acoustic instruments like strings and pianos. The same sort of correctional functionality is also possible in the highs and high mids, and the curve shapes remain pretty smooth even at narrow bandwidth settings. However, there's no doubt that the curves are less musical and more functional than those of the AT4. Out of curiosity, we compared the AT1 to Universal Audio's excellent Neve 1081. In many respects they were similar, but the low-pass filters were gentler on the UA. Not a bad showing at all for the Kuassa version, then, given the enormous price difference! So far, so good, but are there any downers? Well, the gain knobs have no value display at all - a readout in dB would be useful for reference. It'd also be good if the transformer-based input and output stages were modelled too, as these contribute significantly to the sound of the originals. Ultimately, while the AT1 and AT4 aren't the most powerful or flexible EQ plugins, they're well designed and nicely priced.